24 Restore has emergency services 24 hours a day, 365 days a year. 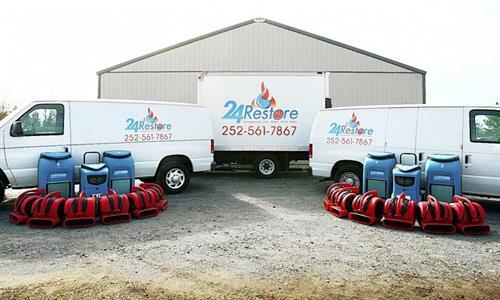 24 Restore is a team of restoration specialist who respond to an array of disasters, cleaning and repair. We have been providing service to eastern since 1996. We provide prompt 24 hour emergency service to residential and commercial properties.We are trained professionals specializing in the handling of emergency situations. We are located in Winterville and serve eastern North Carolina. Our team of professionals respond to water damage,fire, smoke, and mold remediation.